fred figglehorn and George are the best. troll post. Wallpaper and background images in the harry potter contra crepúsculo club tagged: harry potter fred George weasley supernatural badass. Who the hell are those two in the picture? And why the heck would they say that!!!!!!!!!! 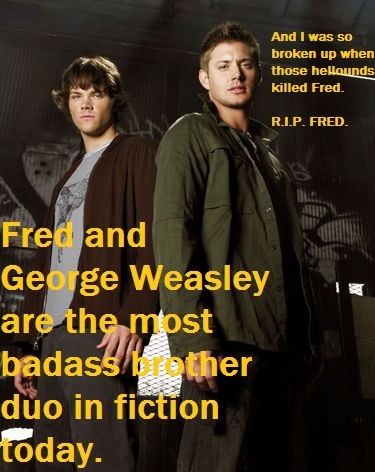 I Love Fred and George!!!!!!!!!!! ^^um... they are the winchester bros from the t.v series "supernatural" people!! may be stupid of me...but still pointing out...don't tell me you don't know who they are!